In less than a week, two clarion calls—one from the realm of religion and the other from the seat of science—managed to fix our attention on the vulnerability of the natural world. It is apt that this encyclical, focused as it is on the environment, should spring from this Pope. Pope Francis, after all, takes his name from St. Francis of Assisi, the patron saint of animals and the environment. And it is refreshing when the message, which calls on us all to be better and more proactive stewards of our planet, is broadcast from somewhere other than the usual conservation or science dais. As if to lend a sense of urgency to Pope Francis’ call to action, however, a second clarion call emanated yesterday from the International Union for Conservation of Nature (or IUCN). IUCN provided an update on the conservation status of thousands of plant, animal and fungi species via the IUCN Red List of Threatened Species. While the update acknowledges a handful of hard-won conservation successes, overall its message is one of alarm. Of the 77,340 assessed species, 22,784 are threatened with extinction. Eighty-five percent of those threatened are in decline as a result of habitat loss and degradation. In Africa, the IUCN update singled out the African golden cat and the African lion as mammals facing serious threats to their survival. Habitat conversion and fragmentation, unsustainable hunting, conflict with humans and a shrinking prey base—all resulting from human activity—have led to a 42 percent decline in the overall lion population over the past two decades. Trade in lion parts has also been identified as an emerging threat, just as the pursuit of ivory and rhino horn for the black market has driven declines in elephant and rhino populations across the continent. As a keystone species, the disappearance of lions impacts the long-term viability of ecosystems. Key to securing their future is ensuring they have enough space to survive and thrive. But in a rapidly modernizing Africa, whose population is expected to more than double by 2050, large spaces devoted entirely to wildlife are becoming increasingly rare. 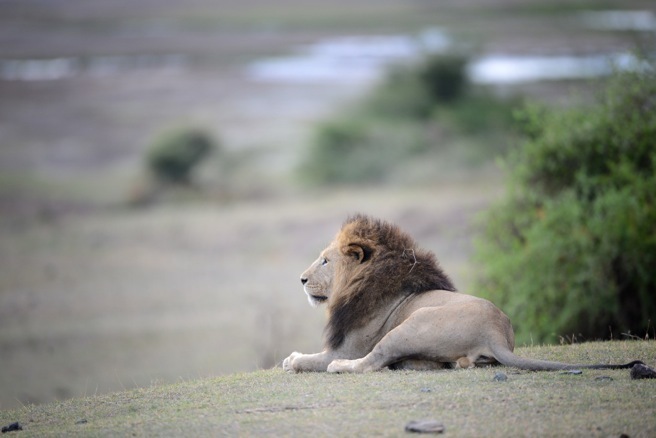 That’s why AWF and other conservation groups, in working to address these direct threats to lions, are establishing wildlife corridors that expand on the total area available to the big cats, and why we are helping to mitigate human–wildlife conflict, a significant driver of the species’ decline. These efforts to secure a future for wildlife in a modern Africa, however, must go beyond the purview of conservation NGOs. If the other species of this world, upon which we all derive great benefit and pleasure, are important to us, then now is our time to show it. As governments, we must show it in our policies and national agendas as they impact wildlife. As urban planners and ministers of agriculture, energy, forestry and mining, we must show it in our land-use and infrastructure development plans. As national wildlife agencies, we must show it in the way we mitigate human–wildlife conflict. As members of the law enforcement community, we must show it in how we combat the illegal wildlife trade. We will eventually stop poachers and traffickers and neutralize the illegal wildlife trade. We will continue to establish wildlife corridors and enhance security and management of Africa’s protected areas. And we can instill a new conservation ethos in the next generation. But all of this will be for naught if we do not acknowledge the serious threat climate change poses to the integrity of our ecosystems. Each country’s decision to act or delay action on climate change has repercussions for every living species on this planet. While populations of lions, elephants, rhinos, pangolins and other species are declining, it is not yet time for despair. We have seen time and again how determinedly Africa’s wildlife bounces back when strong conservation measures are in place. At the turn of the 20th century, there were fewer than 100 white rhinos. Today, thanks to dogged conservation efforts, there are more than 20,000. The critically endangered mountain gorilla that once teetered on the edge of extinction is today the only great ape in Africa whose numbers are increasing. In Uganda, the results from a recent census found that the country’s elephant population has increased by 600 percent to more than 5,000 individuals, an increase that is largely attributed to greater protection of the country’s national park system. This is not to say that these species are out of the woods yet. Last year, 1,215 rhinos were poached in South Africa alone and the population is approaching a tipping point whereby rhino deaths will exceed rhino births. The mountain gorilla population is increasing, but, surrounded by a sea of humanity, the great ape’s habitat remains vulnerable to encroachment, conflict and climate change. The elephant population in Uganda might be increasing, but our jubilation is subdued given the devastating elephant losses in Tanzania, Mozambique, Cameroon and other countries. But nature is resilient and, when given the opportunity and adequate protection, it has an amazing capacity for rebounding. That opportunity and protection must come from us, and they must come now.